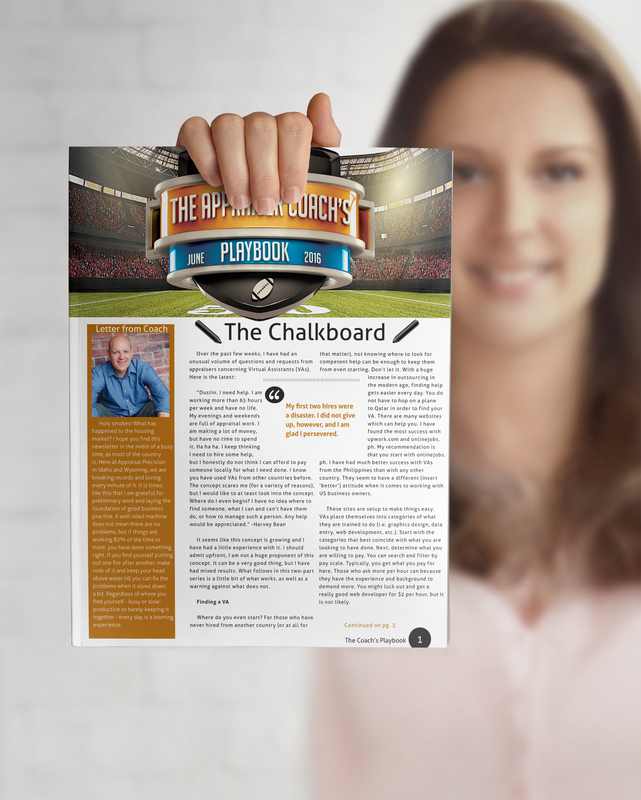 Every month, The Appraiser Coach’s All-star Team receives The Coach’s Playbook. This newsletter is full of detailed business strategies, insider information, questions and answers about how Dustin took a $75,000 per year appraisal business to over $500,000 per year, as well as other VIP information that you can use to transform your own appraisal business. Subscribers are also invited to participate in a private and interactive Facebook Group where they interact personally with Dustin as well as the other group members. Of course, the weekly podcast rounds it all off with up to date information on the appraisal profession as well as what other, forward-thinking appraisers are doing to be successful. This information is not shared anywhere else and has helped dozens of appraisers transform their appraisal job into lucrative appraisal businesses. You too can join The Appraiser Coach’s All-star Team! You will receive tips and tricks to run a successful appraisal office. Plus secrets Dustin uses in his own, highly successful, appraisal firm. View input and feedback from other appraisers who are also members of the team. You will also learn valuable marketing ideas to grow both your lender and non lender business. Exclusive access to a private Facebook page for members only as well as direct access to Dustin. Special, member’s only area full of past video meetings and tools Dustin uses to run his highly successful appraisal firm. Huge discounts (worth many times over the cost of the membership) to Appraiser Coach events, workshops, and special promotions. The Coach's Playbook is now available in audio format! No time to read? Take the Coach's Playbook on the go with you. Due to popular request, the Coach's Playbook is now available in audio format. Now you can listen to Dustin narrate the entire Playbook section by section while you are out and about on inspections or doing write-ups. Available in the 'Member's Section' of the All-Star Team website. You get an inside look at Dustin’s Successful Appraisal Business for only $9.00 per month or save with an Annual Subscription for $95! Interested in an old-fashioned, hard-copy newsletter instead of digital delivery? Those plans are also available.